Diet and exercise affect your blood sugar levels and how your body uses the hormone insulin. Fluctuations in your blood sugar can signify a risk for conditions such as adult-onset diabetes. How much sugar you can safely eat depends on many factors including your overall health, youre regular diet and how active you are. It is important to get your blood sugar levels checked by your doctor to rule out any chronic illness. When you eat, your body breaks the food down into glucose or blood sugar that is used immediately for energy or stored for use later. When blood sugar levels start to rise, the pancreas produces and releases the hormone insulin, which transports sugar into the cells, explains FamilyDoctor.org. As blood glucose levels drop, so does the production and release of insulin. Keeping blood sugar levels under control with diet and exercise is important, because both high and low levels of blood glucose can lead to serious complications if not properly treated. Eating too much sugar does not cause diabetes or influence blood sugar levels on its own, but eating too many calories from all types of food and being overweight does play a role, notes the American Diabetes Association. However, eating carbohydrates that consist of simple sugars such as baked good, cookies and cakes influence blood glucose and insulin levels. 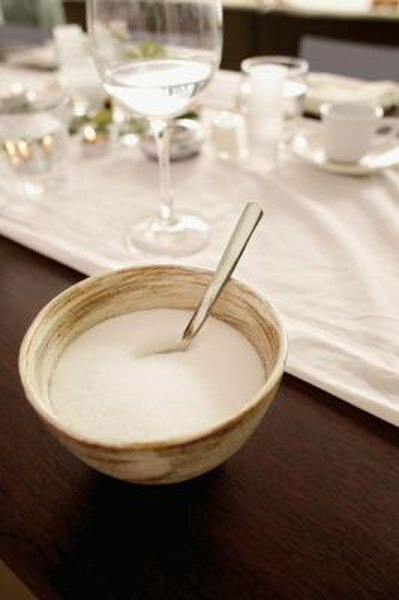 Simple sugars are digested very quickly, which can cause blood sugar and insulin levels to spike. How much sugar affects insulin levels varies from person to person. Each person responds to foods differently and many factors play a role in how well your body can balance blood sugar levels. Blood sugar and insulin levels can be affected by other foods that are eaten, your level of physical activity, stress, illness, medications and even the amount of sleep you got the night before, according to the Joslin Diabetes Center. An accurate way to check the impact of sugar on your body is to test your blood sugar levels after fasting and after eating to see how your body is responding. Talk to your doctor about getting your blood sugar levels tested. Controlling insulin and blood sugar levels takes more than diet. Along with a healthy diet, losing excess weight and getting regular physical activity help your body to insulin more effectively. According to the National Diabetes Information Clearinghouse, losing just 5 percent to 7 percent of your current body weight can cut your risk of developing of type 2 diabetes by nearly 60 percent. Exercise also helps to enhance the rate that your cells use blood glucose for energy and make the cells more sensitive to insulin.